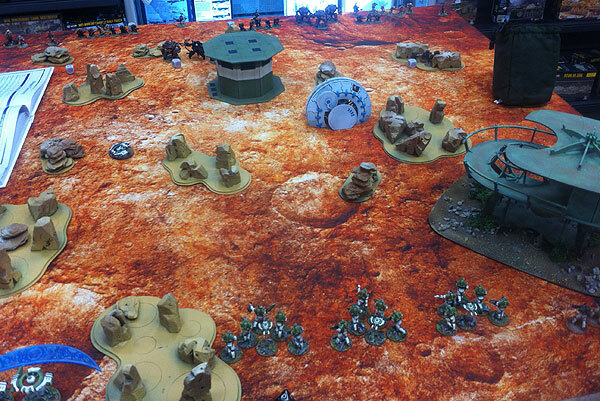 With the support drones out of action, the remaining Concord could do little to stop the battlesuits advancing – I concentrated on trying to knock out the basic Ghar squads in the hope of destroying enough command dice to break them. My most successful squad on the left flank took the Disruptor Cannon out, and then another Black Guard squad towards the end of the game, but other than that it was a disaster. 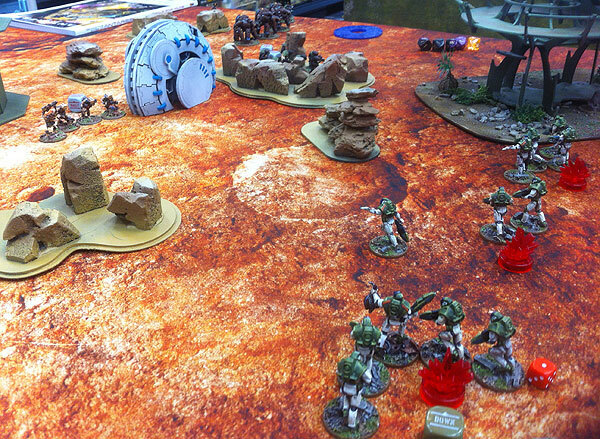 Fartok lost one of his squad, but using his double activation dice stormed through the middle and wiped out a full Concord squad in one go. All that was left in my centre was the battered remnants of two squads. Desperately they shot at Fartok and his accompanying battlesuit in the hope of a lucky hit, and they got one. The battlesuit died and Fartok failed his break test. Their reprieve didn’t last long – bearing down on my right flank was a wall of Ghar, co-ordinated by a Command Squad, that advanced steadily and shot them to pieces, ending the game with a strong Ghar victory (again). Great looking game, how do you find Gates overall? Is it as well balanced as say Bolt Action? Never played Bolt Action. It plays at a good pace, and it isn’t clear what the best tactics or troops are, so I guess it must be fairly balanced.